Only in the fleeting darkness of a total solar eclipse is the light of the solar corona easily visible. Normally overwhelmed by the bright solar disk, the expansive corona, the sun's outer atmosphere, is an alluring sight. How do distant asteroids differ from those near the Sun? 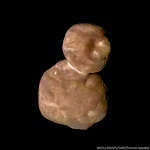 To help find out, NASA sent the robotic New Horizons spacecraft past the classical Kuiper belt object 2014 MU69, nicknamed Ultima Thule, the farthest asteroid yet visited by a human spacecraft. Why is there long red streak attached to this galaxy? The streak is made mostly of glowing hydrogen that has been systematically stripped away as the galaxy moved through the ambient hot gas in a cluster of galaxies. Specifically, the galaxy is spiral galaxy D100, and cluster is the Coma Cluster of galaxies. Do you recognize this constellation? Through the icicles and past the mountains is Orion, one of the most identifiable star groupings on the sky and an icon familiar to humanity for over 30,000 years.